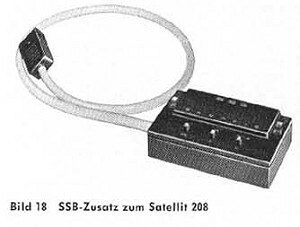 The Satellit 208 was introduced only three years after The Satellit 205, yet it offered many improvements. 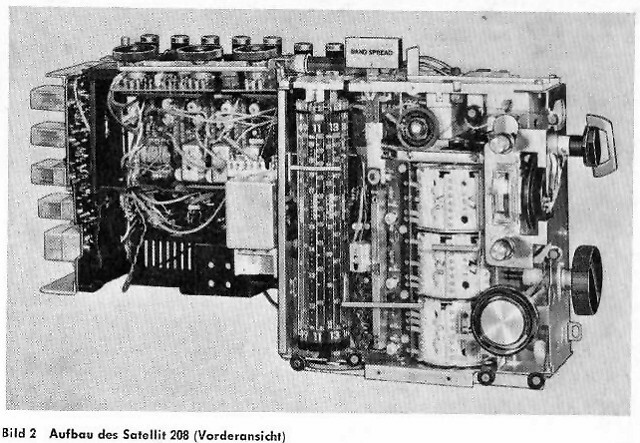 This was the first radio in its class to offer the "double conversion" technology , found in modern receivers today. Field strength transistors were added for FM. Now also has a "Duplex Drive Mechanism"; By turning the lower large tuning control you can tune to an FM- station without altering the tuning on any of the AM (L,K1,M) wave bands and vice versa. 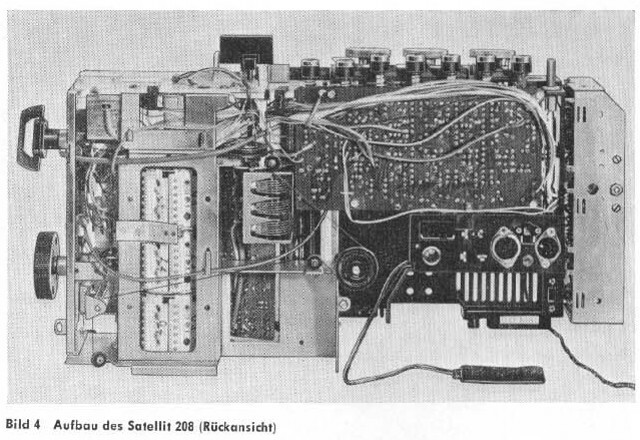 The "Trommel- tuner" (Drum- tuner) mechanism moved position to a vertical position beside the four dial-scales on the front/ right side of the set. 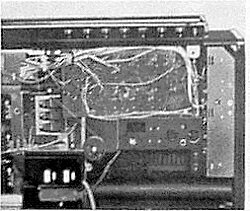 The drum had two more "sides" ,and the broadcast band(s) within a "side" had an additional (switchable) upper scale/ bandspread. 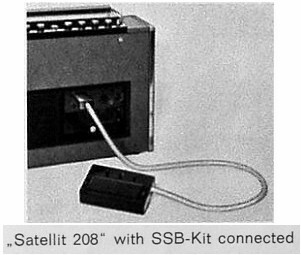 The Satellit 208 had a total of 17 bands ,covering 5-30MHz. 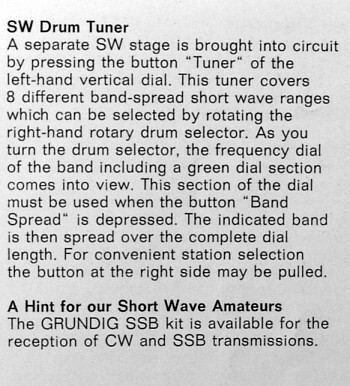 All AM and SW bands ,including the "drum- tuner" ,had new upgraded circuitry. 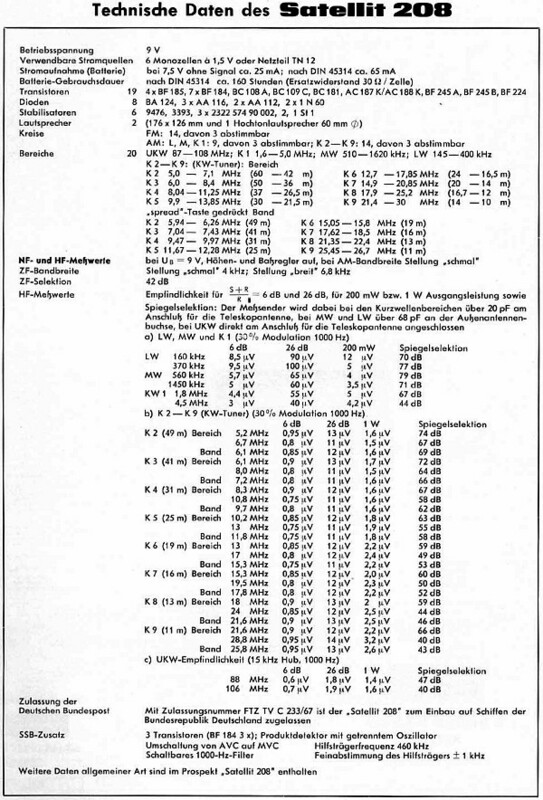 A Bandwith filter was introduced with AM (high/ low cut filter). 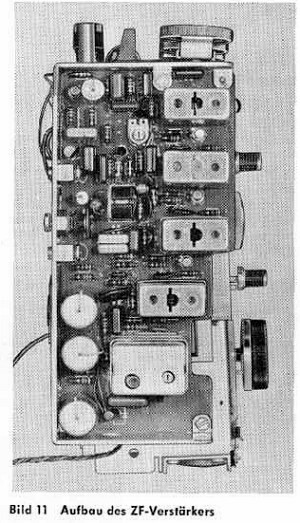 LW was extended to 400KHz and this modification made it possible to use this radio as a certified receiver aboard (commercial) ships. Two speakers in set; one "Multi-octave"/Bass speaker and one tweeter. 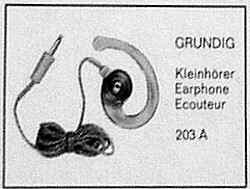 The tweeter is only active in FM-mode or when using the radio as an amplifier. You can also disable tweeter in FM-mode if you want less treble. LW,MW,K1 and FM scales now also had green and red Dial Markers for sliding up or down the guide rail. These dial markers may be considered as further tuning aids. 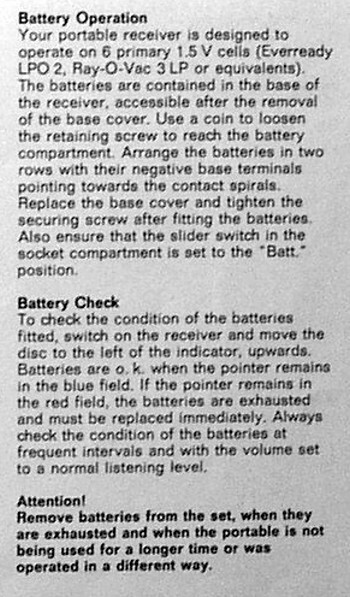 six Dial Markers were "attached" to the set by default ,and an additional 10 pins were delivered with each set. 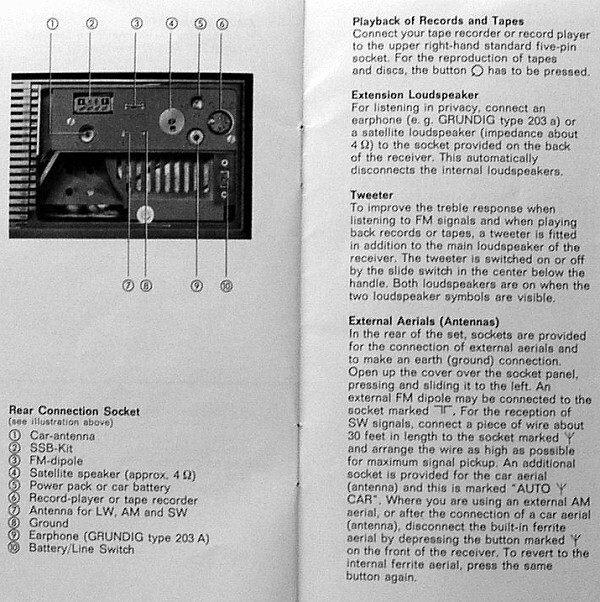 External speaker connection (impedance 4 ohms) and Tape- recorder & Record player connections. 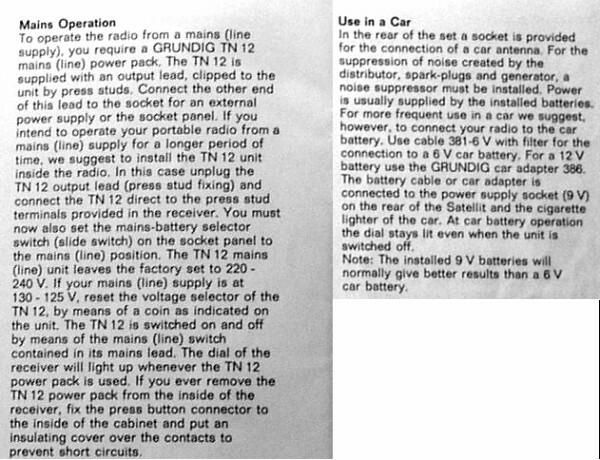 Antenna connections include sockets for an FM Dipole antenna, AM Long-Wire-antenna and Car-antennas. 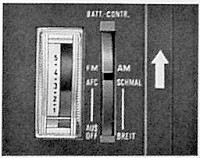 A selector for disabling the built-in Ferrite-antenna is located at the front of the radio. All external connections were neatly hidden in a compartment under a cover. The cover is pushed and slid to the left to gain access. This radio stands out when it comes to reception quality. My unit was cared for by an enthusiast ,it looks and feels like new. 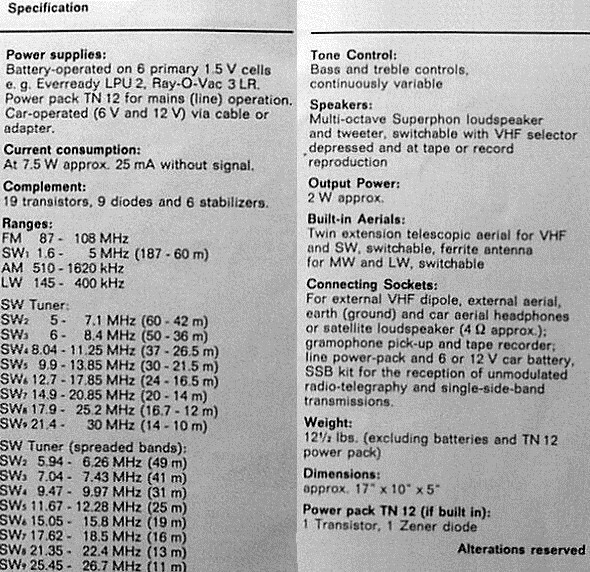 It also has the original/optional separate SSB-Unit. 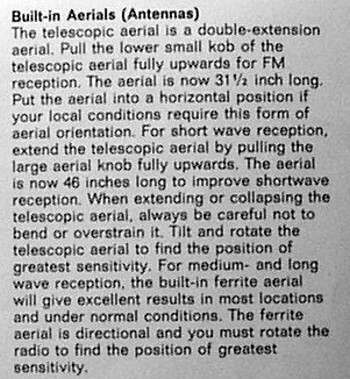 When comparing it to later models in the Satellit- range ,this radio has its obvious strong points. 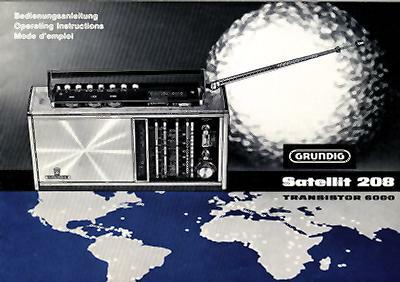 No effort was spared in making this the premium portable "worldband" receiver of the day.